Hi. My name is Jimmy and I work at the University Writing Center. Today I will be discussing degrees of comparisons for adjectives. Degrees of Comparisons for adjectives are different forms of adjectives that allow you to describe one object, by itself, or in relation to other objects. There are three different degrees. The Positive, which is the basic form of the adjective. The comparative. And the superlative. These can be seen in easy, easier, and easiest, respectively. The comparative allows you to compare two objects and superlative allows you to compare three or more objects. The number of syllables in the positive form usually determines the form for the comparative and superlative. Let’s look at an example of this. For instance, the adjective “warm” has one syllable, so it will take the common “-er” (comparative ending) and “-est” (superlative ending). In most cases, positives with two syllables will also use the “–er” and “–est” endings. For example: simple, simpler, simplest. For words with three syllables, you will place the word “more” before the comparative and the word “most” before superlative. For instances: powerful, more powerful, most powerful. The syllable rules are fairly consistent, but sometimes there are exceptions. For two syllable positives, there are some situations that “more” and “most” maybe as acceptable as the “–er” and “–est” endings or even better choices. For example: with the two syllable positive “common,” it is correct to say “commoner” and “commonest” as well as “more common” and “most common.” In such a dilemma, the best method is to see which one is used most commonly in books and journal articles and consulting your instructor to see which form he or she prefers. Also, you may want to remember that positives ending in “-y” “-ow” and “-le” usually take “–er” and “–est” endings. Finally, you should beware of some of the irregular forms. These may look arbitrary to a non-native English speaker. This is understandable considering the positives listed here bare little resemblances to their comparatives and superlatives. Note that some of the comparatives do not take the normal “–er” endings and some of the superlatives do not use “–est”. Pause the screen cast if you need to make note of these irregular, one syllable adjectives. Here in this table are few common constructions used for comparison. 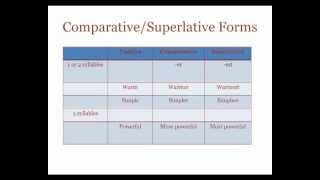 The most common may be “comparative + than” which is used for general comparatives. As in “This quiz was easier than the last quiz.” If you want to indicate that two objects are no different from each other in a certain quality, use the “as + adjective + as.” For example: “Bikes are as fun as skateboards.” Similarly, if you want to indicate that one object is at least equal, if not greater to, the other in terms of equality, use the “just as+ adjective + as” construction. In the example: “That test was just as difficult as the last one.” The indication is that the test might have been more difficult than the last one. Finally, if you want to show one object has less of equality than another object, use the “not as + adjective + as” construction. The example, “The water was not as cold as the soda.” Indicates that the soda was colder than the water. When you are describing matters of quantity using “fewer” and “less”, it is helpful to remember these tips on countable and uncountable nouns. Briefly, a countable noun is one that you can put a cardinal number in front of. Dog is countable- as in- “I have 2 dogs.” An uncountable noun cannot have a number put in front of it. For example, “I have done research” rather than “I have done two researches.” When using “fewer,” you should pair it with countable nouns. For example: “This has three fewer games than the fall season.” I was able to use a number before” fewer” because I can count the number of baseball games in a season; whereas, when you use “less”, pair it with uncountable nouns. The example does not give a numerical amount of research, but rather, a general quantity. In review, for one syllable positives, remember to use the comparative “-er” and superlative “-est” endings. For two or three syllable positives, use “more” before comparatives and “most” before superlatives. Also, beware of the difference between academic and colloquial speech, so you can avoid incorrect uses of “best” and empty comparisons in your papers. Note that two syllable positives can sometimes use “more” and “most” as well as “-er” and “-est” for their comparative and superlatives. Finally, when describing quantities, remember to use “fewer” for countable nouns and “less” for uncountable nouns. Thank you for viewing this Wright Right screencast.